Palmer, Florence Flo, died 5th December 2018, peacefully, beloved wife of the late Edward, loving mother of Steven, mother-in-law of Diana, devoted grandmother of Craig, Matthew, John, Ryan and Nichole. Also a great grandmother and much loved sister. Funeral Service to be held in Wilton Funeral Home, 298 Shore Road, Whitehouse on Friday 7th December at 1.00pm and afterwards to Carnmoney Cemetery East. Family flowers only, please. 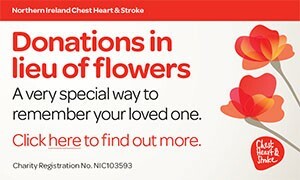 Donations in lieu of flowers, if desired, to Dementia N.I., 54 Elmwood Avenue, Belfast BT9 6AZ. Always remembered by her loving sister Marie and family. Deeply regretted by her sister Rose, brother-in-law Raymond and family. I am sorry to tell you that Florence Flo Palmer has passed away.